SoftPLC Web Studio is a powerful supervisory data acquisition and control software that includes all the building blocks for even the largest systems, yet is priced to be practical for even smaller operator interface (HMI) applications. The same development software can be used to create applications for any of our HMI's or to run on your own Windows-based systems, including mobile and WinCE embedded systems up through redundant Windows Server systems. A simple drag-and-drop, point-and-click development environment lets you create applications to monitor and control industrial automation, instrumentation, and embedded systems via real-time dynamic and animated graphic screens, trends, alarms, reports, recipes, and more. SoftPLC Web Studio runs on systems using the Windows, Windows Embedded, and WindowsCE operating systems, and incorporates many open industry standards (eg: TCP/IP, .NET, ActiveX, OPC, SMTP, SNMP, SOAP, ADO/ODBC, COM/DCOM, OLE, DDE, XML, HTML). Web Studio is scalable - you can develop an application once, and then deploy it to run anywhere including user-provided PC's, SoftPLC HMI's (models SSH-x), embedded computers, or mobile devices such as handheld/pocket computers, PDA's, and smart phones. SoftPLC Web Studio fully integrates Web technologies to take advantage of Internet/Intranet environments for distributed and mobile applications, including browser-based clients. You can send email messages containing real-time process information/alarms, share application information with other software using integrated databases, etc. SoftPLC Web Studio is a complete solution. All functions and communication drivers are included in every license*, there are no modular add-ons required. A host of tag levels provide affordable options for applications ranging from small to enterprise-wide solutions. Full-featured runtime versions are available for standard and embedded operating system deployments, as well as a robust WinCE runtime for systems with limited resources. Keep track of events that occur with this easy-to-use feature! Although Web Studio's built-in features are flexible and powerful, many times users want to implement customized functions, perform advanced data manipulations, etc. Through scripting, the possibilities are virtually endless! Web Studio supports the use of ActiveX and .NET controls. By using open, reusable technologies, the functionality of Web Studio can be expanded beyond the built-in functionality. 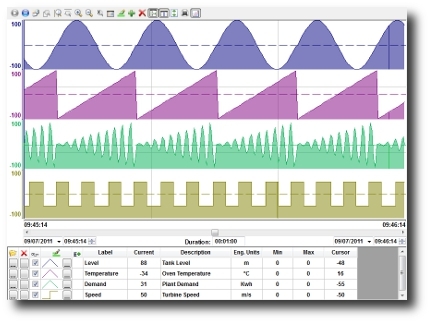 Add controls such as graphing, meters, guages, reporting, browsers and even media players. .NET Components are designed according to the Microsoft .NET Framework, which is a standard for modular programming technologies. Because Web Studio is an .NET container, you can configure and run .NET Components in application screens. The actual functions of a .NET Component are contained within a .NET Control object, which provides the configuration dialogs in Web Studio. Using its embedded database interface, Web Studio can easily provide data from the plant floor to third-party systems (e.g. ERP, MES) or get data from them. Web Studio can interface with any relational database supported by a valid ADO.NET Provider, OLE DB provider or ODBC driver. 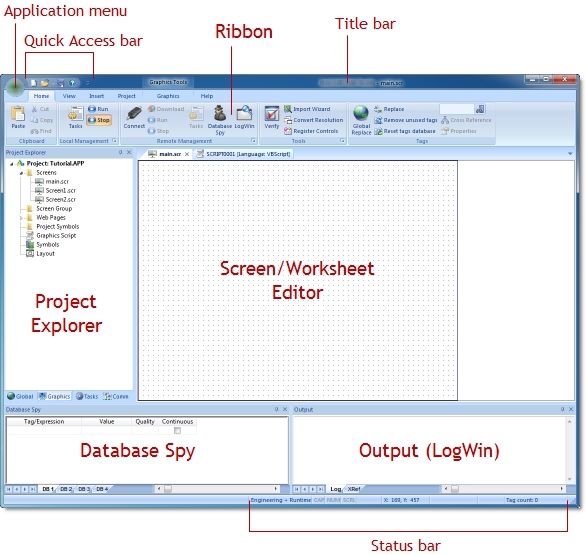 Web Studio easily communicates with SQL databases, including SQL Server 2012. For critical processes, SoftPLC Web Studio provides support to ensure applications run in the event of hardware failures, such as disk drive or communications loss. Redundant database connections are provided in 2 modes - Redundant and Store-and-Forward. Web Studio includes over 240 communication drivers to PLC's, industrial networks, and I/O. All drivers are included with every installation of SoftPLC Web Studio. Drivers supporting major PLC manufacturers such as SoftPLC, Allen-Bradley, Siemens, Schneider, Mitsubishi, Omron, GE-Fanuc, as well as standard protocols such as ModbusTCP, Modbus RTU/ASCII, DeviceNet, Profibus, Interbus and Ethernet/IP are all included. While OPC communication is supported, it is not necessary for communications between Web Studio and most PLCs/controllers. Web Studio is both an OPC DA Server, and/or an OPC Client. It has passed the OPC UA interoperability tests and will soon support this new standard. For more information about OPC technologies, please see the OPC Foundation web site. New drivers can be added through the use of a toolkit, or ask us to quote on development of a new driver for your needs. When multiple users need to run the same Web Studio application, remote viewers make it easy! You can save development time, while also reducing cost in license fees and maintenance, and possibly hardware costs. Web Studio provides 3 types of remote application viewers (thin clients) - Web Clients, Secure Clients and SMA Clients. Runtime licenses includes at least one viewer. Additional client licenses can be added to runtimes. Web Client - Microsoft Internet Explorer based browser ActiveX plug-in that enables full access to any authorized IP address or application. Typically used for remote users who need to access information from the application, trigger commands, and/or modify set-points from systems running Windows, such as PC's, tablets or PDA's. Secure Viewer Client - Secure access over wired/wireless connections via a dedicated viewer where navigation is restricted to specific applications, uses ActiveX technology and includes SSL encryption support. 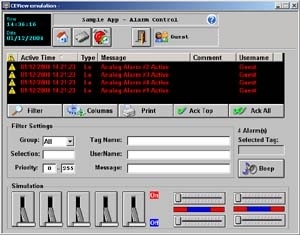 Typically used in applications where there are multiple stations for operators (eg: control room, distributed systems or large machines), or when multiple monitors are displaying different screens from the same project. 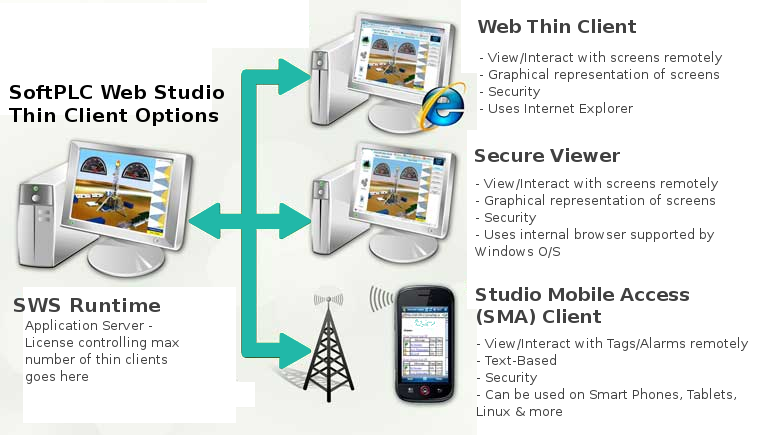 SMA Client - Studio Mobile Access Viewer that works with any browser that supports HTML5, including Windows, Android, iOS, Linux platforms. Typically used by a remote user who needs to access information from the application, trigger commands, and/or modify set-points from systems running any operating system with a browser that supports HTML5. Functions supported are more limited than those supported in the Web Client. The table below lists the number and type of concurrent Thin Client Sessions supported by each type runtime. During development, deployment or after installation, SoftPLC Web Studio provides tools to make it easy to monitor and troubleshoot your applications. SoftPLC Web Studio products are licensed software by number of tags and operating system. Typically applications require 30-40% more tags than physical field I/O devices. Any development license can be used to generate applications for any type runtime target. Development systems run on Windows and are provided by default with a USB hard key (dongle), but you can select a softkey or parallel port hard key as an option. Runtime licenses are available for different operating systems. Runtime licenses are provided with a soft key as standard, with hard key options in most cases. Windows and Windows Embedded runtimes include (1) of each type thin client; WindowsCE runtimes include (1) Web Thin Client and (1) Secure Viewer Thin Client; Linux runtimes include (1) SMA Thin Client. Windows Embedded, WindowsCE, and Linux runtimes are available only for verified hardware and O/S images. Contact SoftPLC if you want to use a system with an embedded O/S. SoftPLC model SSH-x HMIs provide rugged, panel-mount PC-based operator interfaces with a high resolution touchscreen display, with the SoftPLC Web Studio runtime pre-installed and Windows, Windows Embedded and Windows CE options. SoftPLC Controllers can be provided with a Linux Web Studio runtime license to create an IoTPAC. If you have an existing SoftPLC, contact us for details on adding a Web Studio Linux runtime to your system. This evaluation version is a full working product installation that allows up to 40 hours development, and 1 hour runtime each session. A demo application is also included to show the various product features. Product documentation and a tutorial is built into the help system, and supplemental documents such as application notes and communication driver manuals are installed as part of the image.